Two geeks, two cats in an airstream. For the remainder of our stay at Big Bend, we pushed toward the distant eastern side of the national park. 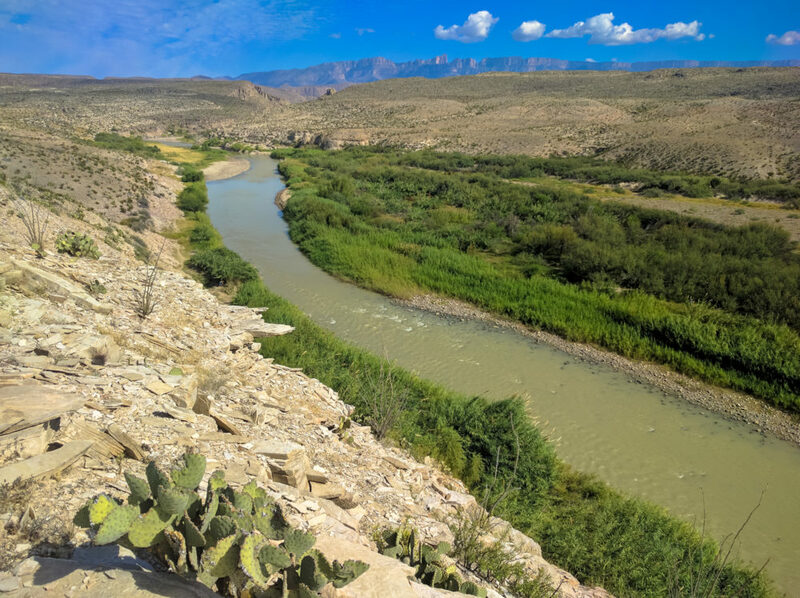 As we drove toward Rio Grande Village, we crossed over ancient limestone-filled lands and marveled at beautiful Rio Grand vistas against the magnificent Sierra del Carmen escarpment. 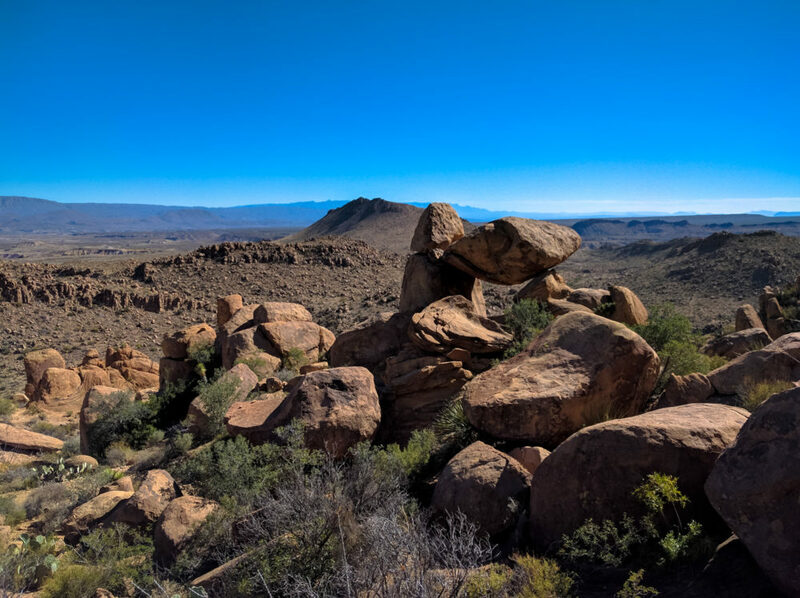 From our basecamp at Lajitas, the total distance is well over 60 miles, with Panther Junction Visitor Center being the midpoint that marks the difference between West and East Big Bend. Without letting the mileage deter us, we embarked toward the rising sun to satisfy our curiosities and discover wondrous things. One early morning, we turned off onto Grapevine Spring Road. This single-lane dirt road is dotted with washboard and rough at the edges. At mile marker six, we parked our truck in a rocky clearing and set out on the trailhead. According to the signs, Grapevine Hills Trail is an easy 2.2-mile round trip hike and leads to a group of balanced rocks in the heart of the Grapevine Hills. 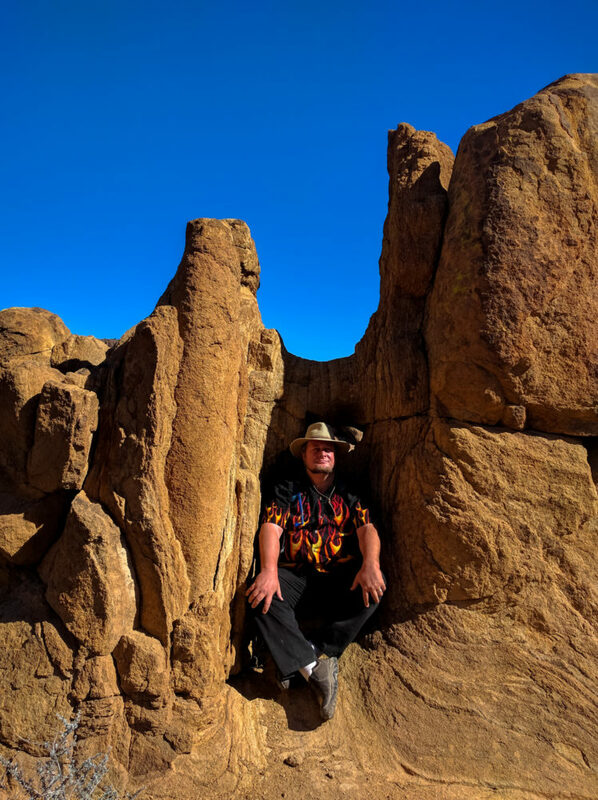 The initial hike took us along a gravel wash where we were surrounded by mesquite, cactus, and yucca. About halfway, we entered in a bowl, where red rocks and stone structures rose up around us. Lizards resting on rocks flicked their tongues at us as we passed, and insects fled in our wake. At the end of the gravel wash, we were fully surrounded by massive rock boulders piled upon each other. Excited by what we could find, we followed the trail markers and climbed a steep path upward into the fieldstones. Among the hills, giant rounded boulders tempt adventurous climbers or curious ringtails and provide homes for wayward snakes and lizards. At the very end of the trail, we finally came upon a giant boulder balanced and suspended overhead by two other rocks. We took a moment to rest and enjoy the view before heading back down to our truck. On another day, we roamed to the Big Bend backcountry. About 18 miles south from Panther Junction Road, we aimed Northward on Old Ore Road. The ten miles on this rugged road rattled our bones! Our 4×4 truck easily traversed over rocks and dipped through dry washes, undaunted by the terrain. We turned onto Ernst Tijuana primitive campsite, found ample parking, and a small sign saying “Do not swim in Ernst Tinaja” marking the trailhead. A rocky creekbed, edged with fragrant citrus-scented desert persimmons, guided us toward a narrowing canyon. 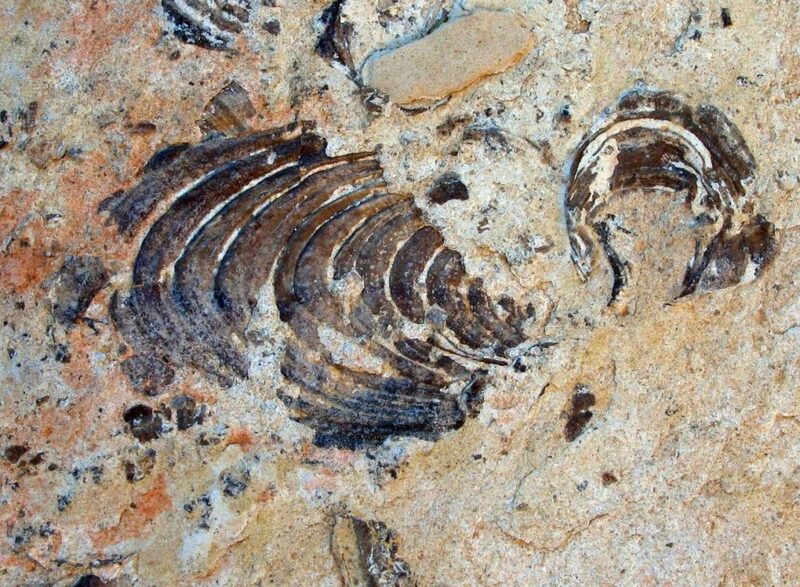 When we turned our gaze downward, we spied fossils amid the colorful rubble. It wasn’t long before we came upon an area filled with uplifted limestone slabs embedded with the fossils of giant oysters, ammonites, and gastropods from the Late Cretaceous Age – a time over 70 million years ago! Water-eroded canyon walls then revealed themselves; their swirling vibrant layers of red, orange and pink rock dazzling us into amazement and wonder. 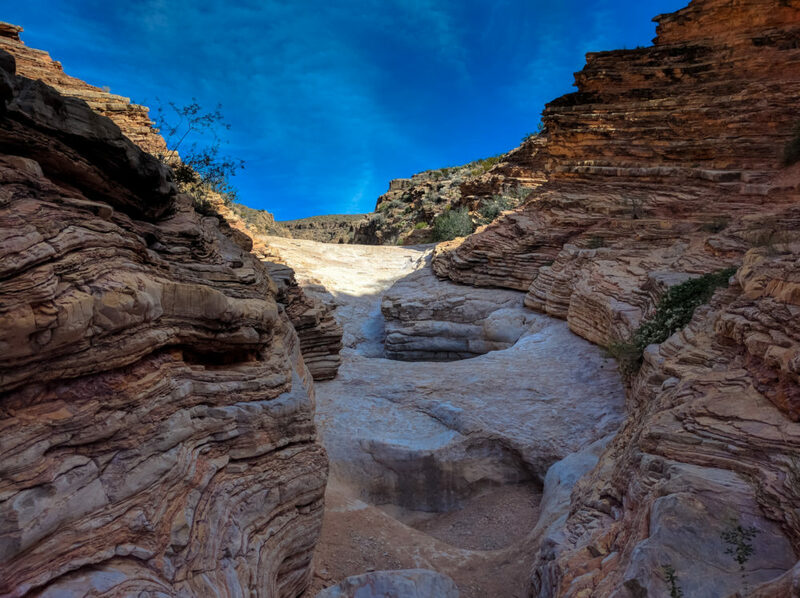 The trail then rose upward into a layer of rock known as the Boquillas Formation (deposited here some 90 million years ago) and then quickly dipped down toward a deep pool known as Ernst Tinaja. Tinaja means “earthenware jug” in Spanish. Ernst Tinaja is the largest in the region and served as an important water source for humans and animals for generations. I remember a ranger telling us to stay clear of a tinaja’s edge — animals sometimes drown in it trying to reach the water. At the time, the water looked murky and dangerous, I couldn’t imagine anyone drinking it, but in a desert, one can’t be choosy about water. We press further into the canyon, the limestone turns white, and we spotted several smaller tinajas tucked away in hidden places. At the end of a trail, we faced a balanced rock and a sheer rock face leading deeper then upward into the hills. Those with climbing gear could make quick work and continue on, but we, on the other hand, must turn around and head back the way we came. The Ernst Tinaja – naturally-formed rock pool which is also referred to as a “kettle”. Hot Springs is one of my favorite hikes along the Rio Grand. 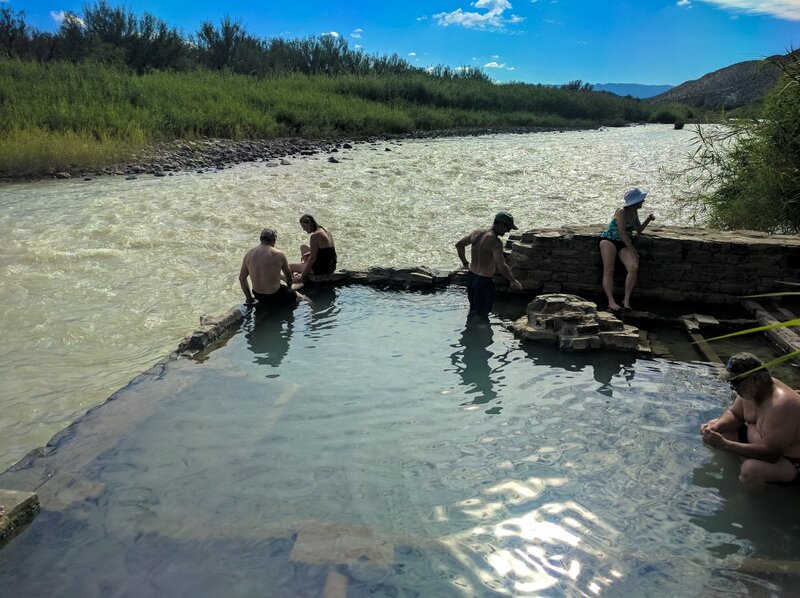 The hike combines two trails in one, and then a relaxing dip in the Boquillas Hot Springs as a reward. From Gano Springs Road (also known as Park Route 12 on the east side of Big Bend), we turned southward on a dirt Hot Springs Road for 1.5 miles before reaching the packed soil parking lot. We missed this road at first, and only realized it when we reached the tunnel at Dead Man’s Curve. Hot Springs Historic Trail by itself is an easy one-mile hike that passes remains of a resort, pictographs, homestead, and hot springs. A brochure at the trailhead offers more information. Just near the resort we took the north fork and continued eastward to the top of the bluff. Sometimes called Upper Hotsprings Trail, this path leads to marvelous views of the Rio Grand and portions of the Sierra del Carmen escarpment. The trail then weaved downward toward the Rio Grand and split into an east-west fork where, Hot Springs Canyon Trail proper lead us eastward along the water edge for a few hundred yards, before it climbed upward along another cliff framing the river. 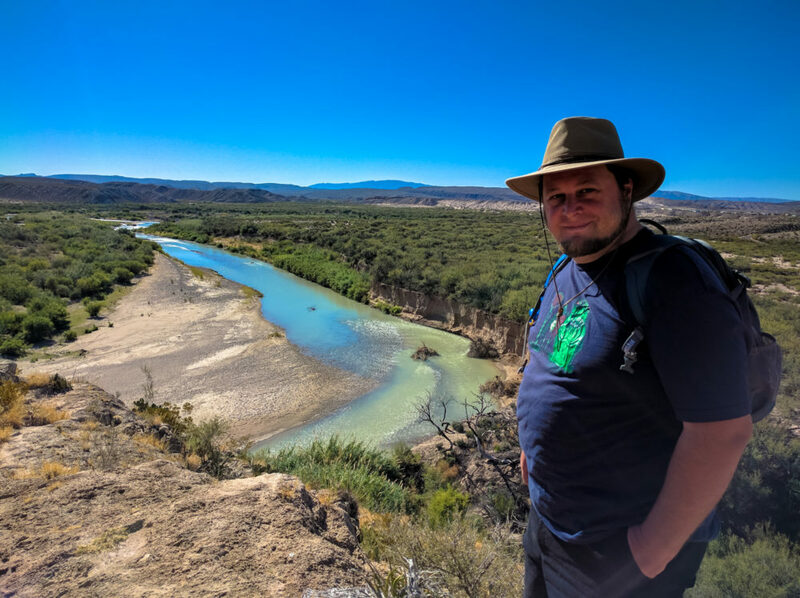 As we stood upon stone outcrop, we paused to take in the stunning desert-scape juxtaposed to the meandering green waters of the Rio Grand. After 2 miles, we finally made it to the heart of Hot Springs Canyon, and just a few hundred yards from the Rio Grande Village Campgrounds. We turned around and headed back the way we came. As we reached the trail fork again, we took the bottom trail along the edge of the water, and then headed toward Langford Hot Spring. J.O. Langford’s impressive bathhouse is long gone, but when we arrived we discovered a spring contained by the ruined foundation of the bathhouse. Together we soaked upon the north bank of the Rio Grande while enjoying the unparalleled scenery. On the way back to our truck, we passed cliffs dotted with fossils and the remains of the old Hotel Resort. Imported palm trees waved so peacefully in the breeze, that we just didn’t want to leave. 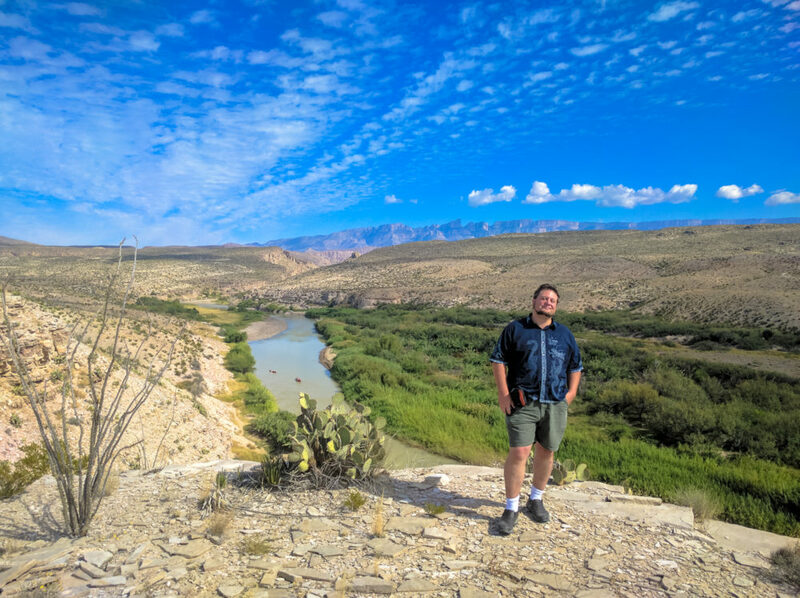 For our final hike, we drove out to Boquillas Canyon, the easternmost of the 3 main narrows sections along the Rio Grande within Big Bend National Park. The canyon itself is about 20 miles long, starting just east of Rio Grande Village. Boquillas is not as deep or sheer as Santa Elena but is still very impressive. 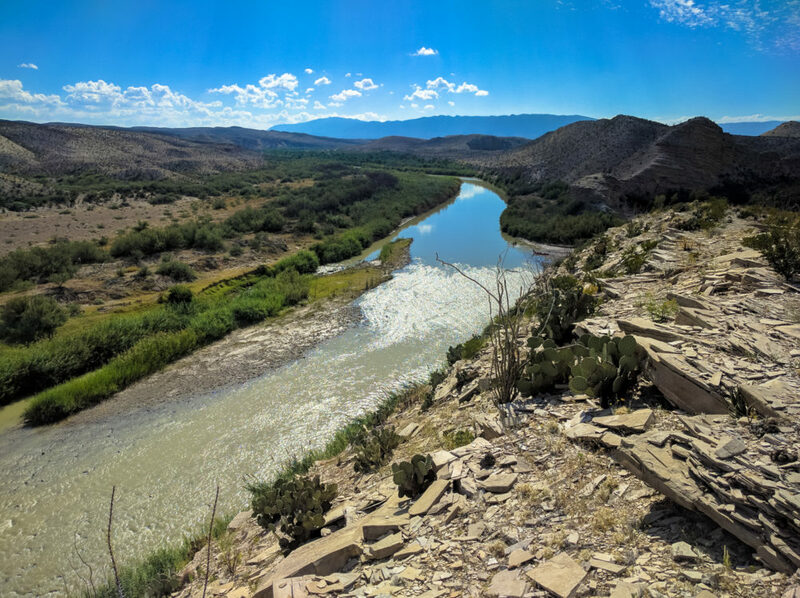 We started at the Boquillas Canyon Trail Parking Area and then a gentle climb to a rocky bluff overlooking the Rio Grande, where we noticed mortar holes formed from native inhabitants. 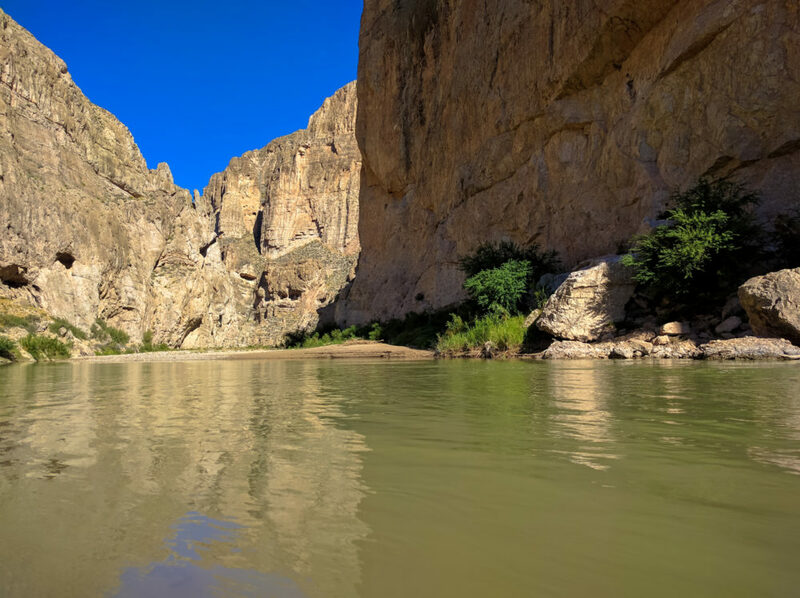 We then descend a gentle slope into the canyon before coming to a wide sand bar alongside the river, where took our time before continuing on to the trail’s end where the water meets the canyon walls. As we walked, we met a man singing, his voice reverberating in the canyon. Over our heads, swallows swooped down for insects and falcons perched in the sheer limestone cliffs. 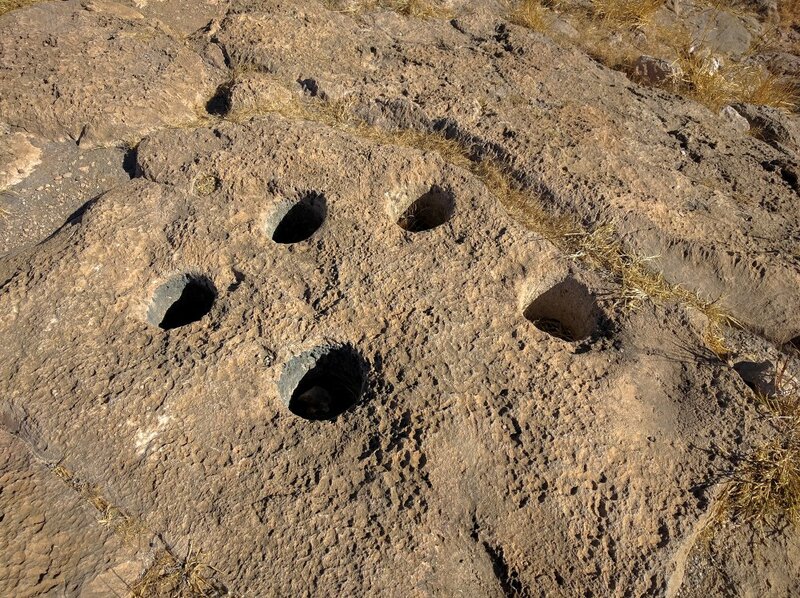 Mortar holes left by native peoples. For those who wish to experience Boquillas Canyon in its full glory, come an hour or two before the sunsets. You’ll be treated to a gorgeous sunset-drop behind the canyon’s western walls. Just be sure to bring a headlamp so you can make your way safely back to your car. Big Bend National Park is a distinct and diverse haven of natural wonder. A land with inky black night skies and astonishing shrine-like fissures carved by rivers. Here you find artifacts of a rich history: from the long forgotten time of sea fossils, dinosaur bones, and volcanic dikes, to the age of man with settlers and ranchers. After a month at Big Bend, I honestly felt that we needed more time. Nearby we had the opportunity to visit Closed Canyon at Big Bend Ranch State Park, take a horse trip up Mesa de Anguilla, or feel the cool spray of Cattail Falls. There was just so much to do in this remote National Park that I’m considering a second trip. 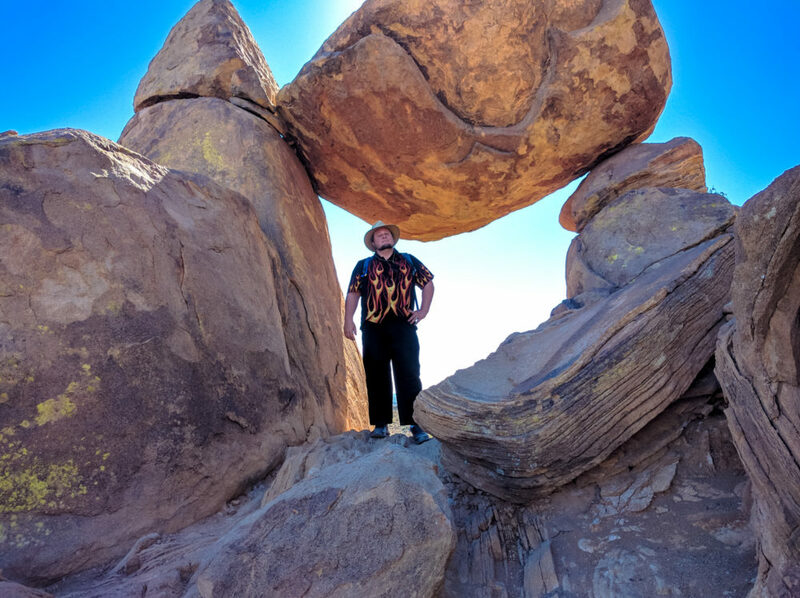 Hitch at the end of the Ernst Tinaja wash.
An attentive wife, lover of geekish things, avid blogger, amateur photographer, and a freelance web developer & desktop publisher for hire who is seeking wisdom through the passions of adventure. Learn more about Trail and Hitch!